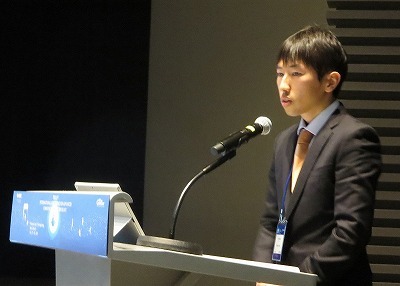 ◎The annual International Conference on Advanced Communications Technology (ICACT)(※1) is a prestigious IEEE conference. It is ranked as the 63rd among 754 international scientific conferences according to the SJR(※2) classification. 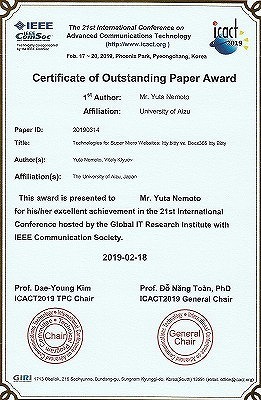 This year, Mr. Yuta Nemoto, 3rd year student of School of Computer Science and Engineering, received the Outstanding Paper Award at ICACT-2019, Korea, February 17-20 for scientific research entitled "Technologies for Super Micro Websites: ltty.bitty vs. Docs365 ltty Bitty". This study discusses the cutting-edge Web technology called "Itty.bitty" which gives a new way of sharing information on the Internet, and clarifies the effectiveness of this instrument by comparing with the other tool called "Docs365 Itty Bitty". 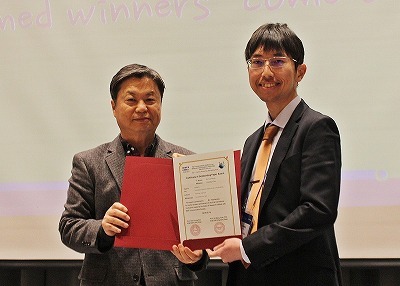 ◎This achievement opened a new page in the university life: For the first time in the history of the university, the undergraduate student received this prestigious award at the IEEE conference!